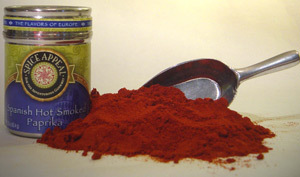 Brought back to Europe by Christopher Columbus from his adventures to the New World in 1492, this deep red, spice gained popularity throughout Spain. Referred to as the “Agridule” type of the Spanish ‘pimenton,’ the drying of the grinded the Red Peppers (Pimientos) in oak wood ovens has created the wonderfully sharp and deep smoky flavor of smoked paprika. This extremely “hot” pimiento possesses a spice intensity unparallel to its traditional Hungarian counterparts. A favorite ingredient in Andalusian cooking. Add to fish dishes, sofritos, bean soups and sausages. A delicious complement to meat and poultry stews, egg dishes, steamed vegetables, and rice dishes.